New York Rangers President and General Manager Glen Sather announced today that the Rangers have acquired defenseman Steve Eminger from the Anaheim Ducks, in exchange for forwards Aaron Voros and Ryan Hillier. Eminger, 26, skated in 63 games with Anaheim this season, registering four goals and 12 assists for 16 points, along with 30 penalty minutes. 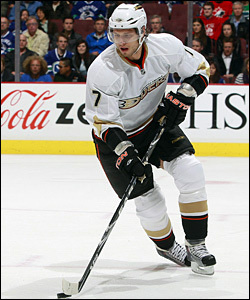 He ranked second on the Ducks with 99 blocked shots, and third among Anaheim defensemen with 102 hits. Eminger finished the season, recording 14 of his 16 points in his final 36 games (four goals and 10 assists). Defenseman Steve Eminger, a first-round draft pick by the Washington Capitals in 2002, has played in 346 NHL regular-season games with the Capitals, Philadelphia, Tampa Bay, Florida and Anaheim. He established a career-high, plus-five rating and recorded two points (one goal and one assist) in a 5-2 win at Colorado on March 31. The plus-five rating tied Anaheim’s team record for plus/minus rating in a single game. In addition, Eminger skated in his 300th NHL game on November 14 at Detroit. Eminger, who helped the Kitchener Rangers (OHL) capture the 2003 Memorial Cup en route to being named to the tournament All-Star team, established career-highs in assists (21), points (26), games played (71), and tied his career-high in goals (five) in 2008-09 while splitting the season between Philadelphia, Tampa Bay and Florida. He led Tampa Bay defensemen in assists (19) and points (23), and ranked second in goals (four) prior to his trade to Florida, in exchange for Noah Welch, on March 9, 2009. Eminger also established a career-high with two, three-point performances that season, both coming against the Florida Panthers on November 18 (one goal and two assists) and December 26 (one goal and two assists). The 6-2, 210-pounder has skated in 346 career regular season games in seven NHL seasons with Washington, Philadelphia, Tampa Bay, Florida and Anaheim, registering 15 goals and 70 assists for 85 points, along with 301 penalty minutes. Eminger notched his first NHL goal as a member of the Washington Capitals on October 10, 2005 vs. the Rangers. He tallied his first career point with an assist on November 26, 2002 at Toronto, and made his NHL debut on October 11, 2002 vs. Nashville. In addition, Eminger has registered one goal in five career NHL playoff games. The Woodbridge, Ontario native was originally Washington’s first round choice, 12th overall, in the 2002 NHL Entry Draft. Voros skated in 41 games this season, registering three goals and four assists for seven points, along with 89 penalty minutes. He signed with the Rangers as a free agent on July 1, 2008. Hillier skated in 22 ECHL games with Charlotte and Wheeling this season, registering two goals and five assists for seven points. He also skated in four games with the Hartford Wolf Pack of the American Hockey League (AHL). Hillier was originally selected as the Rangers third round choice, 84th overall, in the 2006 NHL Entry Draft.